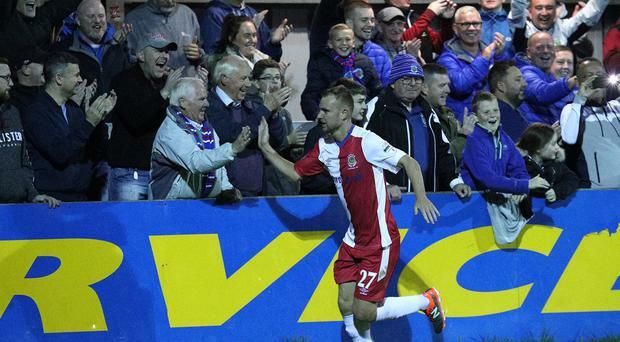 Linfield went top of the Danske Bank Premiership with a 5-0 win over Warrenpoint. A Simon Kelly own goal was the start of a tough night for the Town who ended the game with 10 men when Debutant keeper Aaron McCarey sent off. Daniel Kearns, Michael O'Connor, Andy Mitchell and Andrew Waterworth all got goals for the visitors who made it five clean sheets in six games. It was a big scoring night with 13 goals in the three Friday night fixtures. Glentoran moved up to fourth in the league with a 4-1 win over Newry City and Cliftonville winning 3-0 against Institute. We'll have full reports in Saturday's Belfast Telegraph.